For nearly a decade, Burlington’s 2nd Agenda have been purveyors of a genre-mashing amalgam of hip-hop, rock and rootsy groove flying under the self-ascribed banner of “higher consciousness.” Ironically, attempting to fulfill that designation is exactly what has generally restrained the band from transcending middling pseudo-philosophy and making a true artistic statement. But 2nd Agenda’s latest effort, Hope Is A Must, suggests they may yet get there. Just as their promising 2009 album, Take Cover, improved upon a mediocre 2004 debut, Connect, this five-song EP represents another step forward. Based on production value alone, the CD blows away anything else in the band’s canon. Front man Andy Lugo’s guitars blister with fire and precision. Turntablist Michael Plante’s samples and cuts carve indelible marks into the sonic façade. Drummer Trevor Jewett and bassist Joshua Cleaver make a formidable rhythm section. This is the strongest lineup the ever-fluctuating band has ever fielded. Its members tear through a dazzling assortment of ambitious arrangements with veteran guile, from chill, hip-hop-laced roots-funk to anthemic pop-punk and heady groove rock. In short, the record sounds great. But music with a message must be judged on the strength of its words. Lugo’s most recent venture was a self-titled collaboration with Burlington producer Face One, released earlier this year. On that EP, Lugo set aside bumper-sticker prose and dug deep, producing his most effective, and affecting, material yet. Rather than regurgitate generic inspirational platitudes, he crafted personal stories and gave them room to resonate without force-feeding the audience “deeper meaning.” Refreshingly, he trusted us to figure it out. The moments on Hope in which Lugo follows that latter tack — as on the shifty “Share the Sun” — are standouts. The moments when he reverts to obtuse sermonizing — as on “Hope Is A Must,” which is every bit as cloying as its title suggests — drag the record down like an anchor. Fortunately, such instances are infrequent. The bulk of the EP, while clearly intended to inspire change, whether societal or personal, finds the rebel folk philosopher generally toeing the line between sanctified and sanctimonious. Though he occasionally teeters, by and large Lugo pulls off a mean feat: Preaching without being preachy. 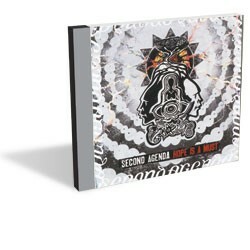 2nd Agenda release Hope Is A Must this Saturday, July 2, at Nectar’s in Burlington.